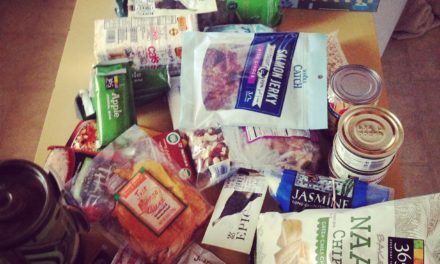 For multiple day backpacking trips bring lightweight foods with a long shelf life. Surf N Turf style Pita sandwiches are a hearty backcountry lunch made to withstand the journey. They feature pack friendly ingredients that can can last up to 7 days unrefrigerated. Plus, Surf N Turf Pitas are heavy on nutrition and big flavors. Try Surf N Turf Pitas on stove-less distance trips! 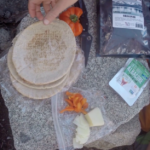 This fantastic lunch recipe is ideal to make several days into a backcountry trip. The jerky and salmon will remain fresh for months if correctly sealed, and if you keep the pita away from warm conditions, it will last a week without refrigeration. You can typically find pitas in the bread aisle of a grocery store, or if you prefer you can make a fresh batch at home. Pitas are easy to cook with! They hold a lot of ingredients and you can eat without making a big mess. Pita bread can be very brittle when cold, which is important to take into consideration when constructing pita sandwiches. The best way to make a Surf N Turf pita sandwich is to first warm up the pita. We recommend setting the bread out in direct sunlight for 4 minutes (two minutes on each side). This will give the pita a chance to warm up, which makes it less likely to crack and fall apart. 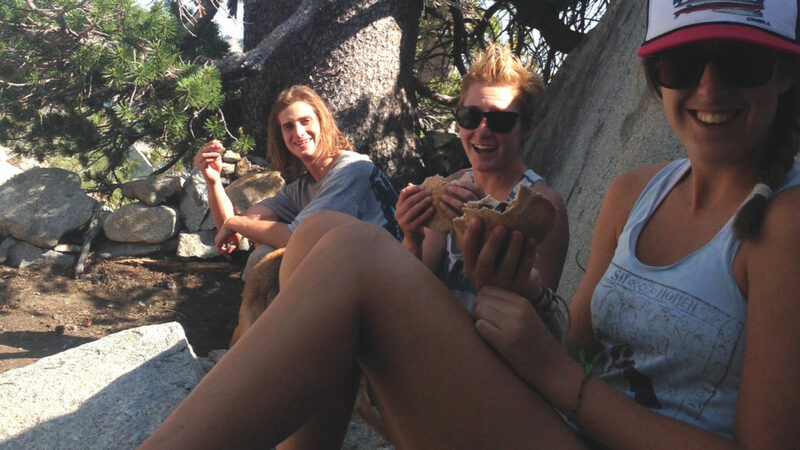 Construct a pita based lunch using your favorite trail ingredients. We suggested one of our favorites below in our Surf N Turf recipe, but the possibilities of what can be put inside a pita is seemingly endless. You can use leftovers, cured meats, hard cheeses, spreads, vegetables, fruits, condiments, etc…. Stock up on your favorite condiment packets such as sweet chili sauce, sirracha, vinaigrette, to add big flavors to your pitas. For an awesome ultralight sauce check out B.Redi’s dehydrated salsas, which are great for dipping and as a spread. Like most adventures, these Surf n Turf Pitas are best enjoyed with great company and spectacular views! Happy trails. Meat and Seafood Pita "Surf N Turf"
Surf N Turf Pitas are a built for long trips in the backcountry. This recipe's ingredients can last many days without refrigeration (if stored properly). Don't forget the sweet chili sauce or your favorite condiment! Gently slice an opening in the pita and separate pita walls to make a pocket. Try not to puncture the pitas walls. Spread Cream Cheese on inside of pita using backcountry knife. Add Bell Pepper, Jerky, and Tuna. Top with Sweet Chili Sauce or your favorite spread. Close pita, find a comfy seat, and enjoy. 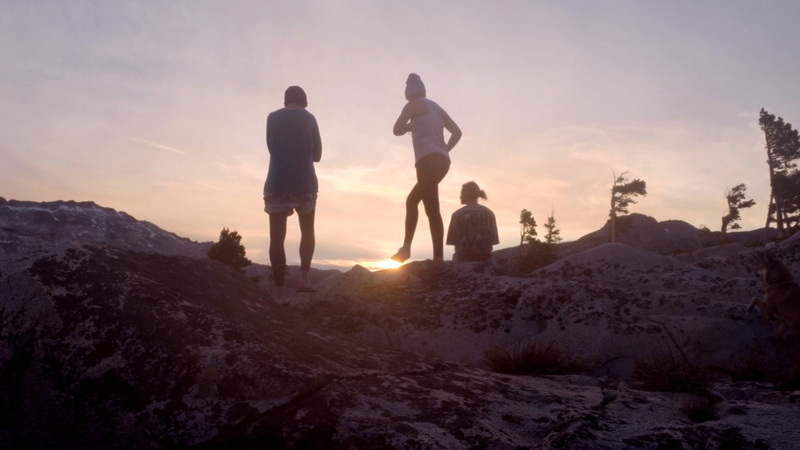 When you're done eating be sure to pack out all waste, clean up prep and eating area, and always leave no trace.